How are 1,000 more pallet housed in the same storage area? Mecalux has installed the Pallet Shuttle system in the warehouse Marvimundo has in Murcia to increase the storage capacity by more than 1,000 pallets in the same surface area and space available. That way the company maintains its commitment to innovation and constant improvement in its production processes to cope with the growth achieved in recent years. Marvimundo, founded in 1971 in Murcia, began focusing on the sale of plastics and drugstore goods, and subsequently developed new products and services to expand its market. At present, it has become one of the most prominent Spanish companies in the perfumery and personal hygiene sector. The company's warehouse was equipped with pallet racking, but the storage capacity was insufficient for its logistical needs. Increased sales forced them to reorganize the distribution and classify the goods in terms of turnover and consumption criterion. Marvimundo required a system that would increase the storage capacity and in turn offer speedy operations, similar to standard pallet racking, to deposit consumer products (type A). To achieve this, Mecalux has supplied a high-density block of 271’ long racks served by the Pallet Shuttle, consisting of five levels that are 28’ high. The semi-automatic Pallet Shuttle system optimizes the storage capacity of the high-density racking and minimizes operating time because operators do not enter the aisles to handle the goods, it is the shuttle which carries out the movements autonomously. In the Marvimundo warehouse, a lot of picking is performed. That is why a specific area for this operation was set up on one side. The Pallet Shuttle system, among high-­density systems, is the best suited to the features of the Marvimundo installation since it allows the quick placement and extraction of pallets in order to send them to the order preparation area. Its operation is very simple and requires minimal labor: operators assisted by reach trucks place the motorized shuttle into the channel, deposit the pallets in the first position of the racks and the Pallet Shuttle transfers them directly to the next free location autonomously. To remove the goods, the same operation is performed in reverse order. The shuttle is equipped with various electronic and mechanical components to ensure proper operation and that the movement within the lanes occurs with the utmost safety. It is also fitted with a bumper that prevents any trapping and crushing; emergency stops that cut power if necessary, as well as a locking system that improves contact of the shuttle with the forks of the forklift and eliminates the risk of falling. There are also ultrasonic sensors that locate the position of the pallets in the channels so that the Pallet Shuttle is correctly placed underneath to move them. Each tablet can operate any shuttle in the installation via Wi-Fi and through a very intuitive software that does not require specific training of the operators. With tablets, operators can run many applications and functions, such as selecting the number of pallets to be extracted, taking an inventory of the number of pallets available, choosing the strategy (set the LIFO or FIFO method) and managing users and authorized personnel. In the warehouse, there are replacement batteries to load into a piece of equipment while the Pallet Shuttle continues to work within the channels. Batteries extracted from the shuttles are connected by simply fitting them into the charging stations set up in the warehouse. In addition, in the charging stations, there is also a separate cable that lets you charge the shuttle directly, without removing the battery. Increased storage capacity: 277 channels, each 19.7’ deep, provide a storage capacity of over 1,900 pallets, 1,000 more than pallet racking. Speedy high-density system: among compact systems, the Pallet Shuttle is the most flexible to facilitate the introduction and removal of pallets in channels with minimal operator intervention. Classification by consumption: the warehouse is organized according to consumption criterion. 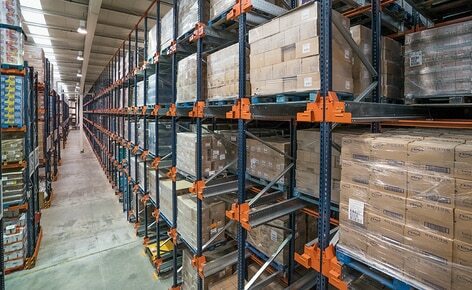 Consumer products (type A) are deposited in the high-density racks served by the Pallet Shuttle.